Health Costs > How Much Does a Bone Density Scan Cost? 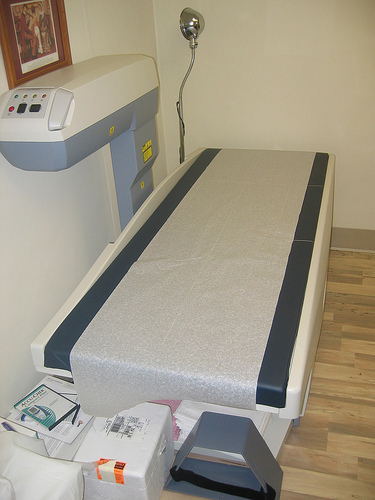 How Much Does a Bone Density Scan Cost? A bone density scan, also known as a bone mineral density test or a BMD test, is a noninvasive and painless procedure used to measure and evaluate the density of the bones. This test will check how strong your bones are by measuring a small part of them and help your doctor determine how you can treat or prevent bone loss/fractures in the future. This test is particularly useful for someone who has osteoporosis. This type of scan is a form of nuclear imaging that allows doctors track several types of bone diseases, and typically, they will order one if you’re experiencing unexplainable skeletal pain. The cost of a bone density scan will depend on the type of bone density scan your doctor orders, where you live, where you have the bone density scan done and if health insurance is going to be involved. The most common type of a bone density scan, DXA, will often cost $150 to $325 without insurance. However, if you did have a health insurance plan, then you would be responsible for your co-pays and deductibles, but according to our research, the average patient with insurance would pay about 10 to 40 percent of this amount, which equates to about $15 to $120, depending on the insurance provider you have. EverydayHealth.com says not every insurance plan will cover this type of scanning tests, especially if the patient is younger than 65 years old without any risk factors If you do decide to pay out of pocket, according to the website, then you should be prepared to budget $125 to $300, depending on the facility you choose. New Choice Health listed the cost averages across the country, with prices ranging from as little as $110 to more than $1,400. There are two types of machines that can measure the bone’s density. Central machines, for example, will measure the hip, spine and total body, and doctors can use two options: DXA and QCT. The DXA measures the spine, hip and total body, and doctors often find this test to be the most useful option, according to WebMD. This will be the test used most of the time as it’s considered extremely accurate by most doctors. A QCT will usually measure the spine, but it can measure other parts of the body as well. This test will show you how well your osteoporosis treatments are working. A peripheral machine, on the other hand, will be designed to check your heels, fingers, knees, shinbone and wrist. These machines can be used when a DXA isn’t readily available. A peripheral screening test can include the following: a pDXA, SXA, QUS, pQCT and RA. Regardless of the bone density scan you have done, the average test will take 15 minutes and will be generally be done in the doctor’s office. Simple tests can even be done at a local drugstore or pharmacy. If you have the test done at a hospital, a central machine will more than likely be used. Inside a central machine, you will lie on a padded platform while a mechanical-like arm will pass over your body. The test will usually be done in 10 to 30 minutes. At a local pharmacy or doctor’s office, a small portable machine may be used. This small device will scan smaller bones such as your finger, heel or wrist. Patients who find themselves with a low bone density may be prescribed medication, vitamins and/or supplements. Follow-up visits may be recommended in the future as well. These tests are known to have no side effects and are considered to be very painless. The Mayo Clinic says there’s no preparation involved. Most health insurance companies, including Medicare, will cover a bone density scan as long as it’s deemed medically necessary. This can include a test performed for a fracture, if you’re taking medications for bone thinning, you’re not taking estrogen during menopause or you have been through menopause and are older than 65. To play it safe, talk with your health insurance company ahead of time to know if your policy will be covered. If you have health insurance, check with your insurance provider to see what you are going to be responsible for. Chances are, you will be responsible for your co-pay and deductible. For those who do not have health insurance, eHealthInsurance.com is a great choice to find policies in your local area. If you don’t have health insurance and don’t plan on using it, consider paying cash up front as many providers do offer a discount to those who pay in full. Even if you can’t pay in full, some hospitals may be able to provide assistance to those who meet certain income requirements.